I recently saw a U.S. Air Force F-22 flight demonstration at the Dayton Air Show. It was incredible and I wasn't the only one looking up with mouth agape! However, I was probably the only one who kept thinking the almost preternatural agility of the Raptor was akin to the flight capabilities of a robber fly (family Asilidae). Robber flies are one of my favorite groups of insects and the Red-Footed Cannibalfly (Promachus rufipes) is one of my favorite robber flies. I share this insect-affection with my good friend, Ron Wilson (Natorp's; In the Garden with Ron Wilson (iHeartRadio)). Few carnivorous insects can match the amazing acrobatics and predatory proficiency of this and other robber flies in their pursuit of prey. Adults of all species are predators and they will attack a variety of insects including insects much larger than their own body size; even "armed" prey such as yellowjackets and bald-faced hornets. There are over a thousand species of robber flies in North America representing a wide range of forms and sizes. 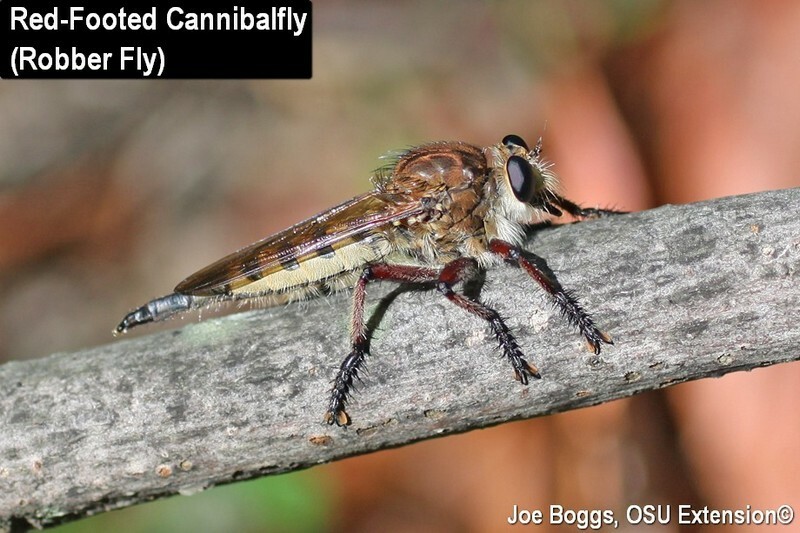 The Red-Footed Cannibalfly is the largest sized robber fly species found in Ohio; the flies measure over 1 1/4" in length. The entire body design of this fly foretells its predatory lifestyle. Their long, narrow body aids in stream-lined flight just like a fighter jet. Their stout thorax is packed with muscles to operate the wings and legs and the ball-like shape serves as a battering ram; think linebacker. Each of their long, dangling legs is tipped with two formidable tarsal claws that function like grappling hooks. Cannibalflies makes a loud buzzing sound as it flies; certainly not as loud as an F-22 on full afterburners, but loud enough to draw your attention. An alert observer may hear the buzz periodically punctuated by a very loud "snap" which means the fly has committed an insecticidal act. The snapping sound comes from a smashing display of aerial acrobatics when the fly slams at high speed into its airborne quarry stupefying the hapless insect victim. The fly then grasps its dazed prey with its claws, and uses its piercing-sucking mouthparts to inject saliva containing neurotoxic and proteolytic enzymes. The enzymes paralyze the victim and digest the internal tissues. The fly then lands and sips the essence of insect out of its victim; it robs them of their life. Robber fly larvae are also predaceous and live in the soil, or in decaying wood and other organic matter, where they feed on insect larvae. Although robber fly adults and larvae rob insects of their lives and are generally considered beneficial, a few species test the limits of "beneficial." As their common name indicates Bee-Killer Robber Flies (Mallophora spp.) commonly attack bees including honeybees. Likewise, robber flies belonging to the genus Laphria will also attack bees. These robber flies mimic bees and are sometimes called Bee-Like Robber Flies.